Solutions for a stress-free (well, almost stress-free) Holiday Meal! You’ve made your guest list (yikes–can it really be as many as 35 people?) and then scoured the pre-holiday farmers’ markets for the most beautiful local produce, meat, and fish. Now you only have to figure out how to feed everyone in style and still have a great time yourself! Greg Jordan, chef of the Quarry Restaurant in Hingham, offers some timely hints for getting out ahead of your holiday feast. The Holidays…however you choose to celebrate, there is often a big meal involved with many guests all gathering around while you frantically try to prepare dinner. In my family, that number can sometimes run north of 30 people. With the help of a little culinary school, several years of experience in the kitchen, and a few crazy family dinners, I’m happy to share my tips with you on how to relax a little and prep some of the worries out of your meal! Buy the best bird you can find—look for something that hasn’t been frozen. That plastic timer thing that someone shoved into your turkey is useless. Use a thermometer—preferably something that reads quickly (in the kitchen we love the Lavatools Javelin) and cook your turkey to 165 degrees for breast meat and 180 degrees for the dark meat. Pull the bird out of the refrigerator at least 2 hours before you put it in the oven; bonus points if you keep the breasts chilled with ice packs. If the turkey is big, like over 18 pounds, start the turkey upside down at 450 degrees for 30 to 45 minutes, depending on the size. This will give the dark meat a blast of heat, and help bring the slowest cooking part of the turkey up to temperature more quickly. I’ve cooked all kinds of turkeys, but the way I have been enjoying the most has been roasting it whole with a dry brine, or gasp, braising the legs separately in cider and aromatics, and simply roasting the breast with a nice herb rub and butter baste. The braising liquid also makes for amazing gravy, as long as you don’t brine the bird before. This method will limit your options for presentation, so take that into consideration. 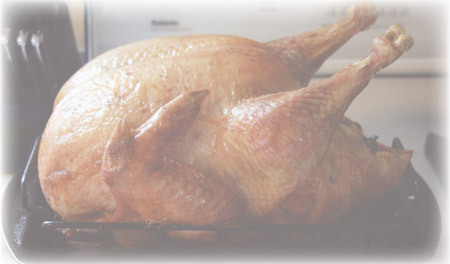 Always allow your turkey to rest for at least 30 to 45 minutes. Don’t ruin that beautiful skin with a tinfoil tent. Use this time to reheat the vegetables that you prepped last night, dress the salad, and pop that side dish in the oven to warm back up! I prefer to use Yukon gold potatoes. Peel and cube them the night before and soak them in cold water in their cooking pot. The next day rinse the potatoes, add fresh water, bring them to a boil over high heat with salt, and cook until tender. Yet another vegetable that can be trimmed and blanched the day before, then sautéed in a little butter right before dinner. These have become a family favorite, and are another great prepahead item for dinner. They can be trimmed, blanched, halved, and stored in a colander inside a bowl overnight before browning them on the cut side right before dinner. An added benefit of this overnight technique is that excess water hiding in the leaves will drain off. Something that’s so easy to make a few days ahead, and highlights the great local cranberry crop that we have. Make the recipe your own with a splash of your favorite alcohol or seasoning! Chef Greg recommends making this sauce a day or two ahead. so the flavors have time to meld. Bring all the ingredients except the cranberries to a boil in a nonreactive saucepot. Add the cranberries, lower the heat to a simmer. stir, and cook for 5-6 minutes, till about ¾ of the berries have popped, stirring constantly. Transfer to a non-reactive storage container, and cool on the counter for 30 minutes, then refrigerate overnight. In a large skillet, render the pancetta until crispy over medium heat. Remove the meat to a paper towel. Tum up the heat to high and add the sprouts. Cook, tossing, for 5-8 minutes, or until cooked to your taste. Add the vinegar, tossing the sprouts about while it reduces to a sauce-like consistency. Add the butter and pancetta and tum to coat. 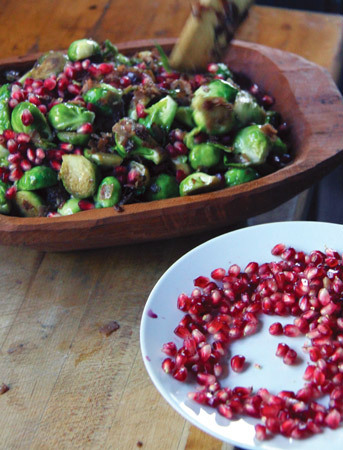 Serve sprinkled with pomegranate seeds. Preheat the oven to 325 degrees. Butter a 10”x14” baking pan or very large casserole. Heat the oil in a very large skillet over medium-high heat. Add mushrooms (in batches if necessary) and cook, tossing frequently, until cooked through and lightly browned, 5 to 10 minutes. Add garlic and shallot in last minute of cooking. Turn off the heat and add the herbs and season with salt and pepper. In a large mixing bowl, beat the eggs and yolks. Beat in the cream, milk, and cheese. Add the bread cubes and allow to soak for at least a few minutes. 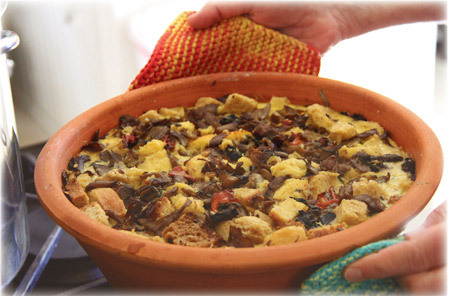 Turn in the mushroom mixture, and mix well. Pour into the prepared baking dish and cover with foil. Bake 45 minutes; remove foil and bake 30-45 minutes, or until pudding is set in center and top is delicately brown. Greg Jordan, chef and proprietor of The Quarry, Hingham, cooks for Thanksgiving dinner for 35 friends and family each year. The Cambridge School of Culinary Arts alumnus puts years of experience into his holiday meal and loves to share his cooking tips.